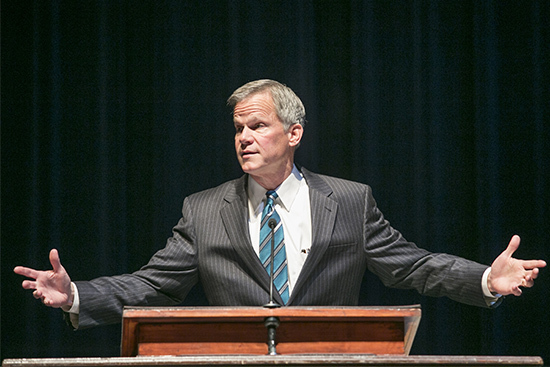 The faithful who follow God’s way can count on Him, Samford University provost and executive vice president J. Bradley Creed told the audience at the opening convocation of the spring semester Jan. 27. Creed based his remarks on Psalm I to kick off the term’s convocation series, which will focus on the book of Psalms. The unusual and lengthy book of Psalms, Creed explained, encompasses every human experience and thought. Running the gamut from joy to anger, from hope to doubts and despair, the scriptures fall into categories of orientation, disorientation and reorientation. The orientation Psalms align and position, while the disorientation Psalms acknowledge that life can be hard and filled with disappointments such as career obstacles or matters of the heart. The reorientation Psalms, with a promise of new life and beginning again, “Help us to get up when we are knocked down,” Creed said. “Our lives are a cycle of these Psalms,” said Creed, who was presenting the final semester opening address of his 12-year tenure as Samford’s chief academic officer. In July, he will become president of Campbell University in Buies Creek, North Carolina. But this can come only by learning from God’s law. “The law of the Lord is for your benefit, and can be a means to ordering and re-ordering your life. You should find great joy in it,” Creed said. “Wicked people don’t follow the way of God, but the righteous have chosen God and God’s way. It’s a clear choice,” he said, urging the students to think about the direction of their lives as they begin the new semester. He noted that Psalm 1 and the final Psalm 150 are like bookends, with the first being about faithfulness and obedience, and the concluding one about praise. “You can count on God and a life that begins with faithfulness and ends in praise. Praise is the culmination of a faithful life. You can count on it,” said Creed. The convocation program included the presentation of the George Macon Memorial Award for teaching to music professor Moya Nordlund and the Jennings B. Marshall Award for faculty service to English professor Steven Epley. Geography professor Eric Fournier was recognized for being named the 2014 Alabama Professor of the Year aby the Carnegie Foundation for the Advancement of Teaching in the fall. He was recently named director of Samford’s Center for Teaching, Learning and Scholarship.